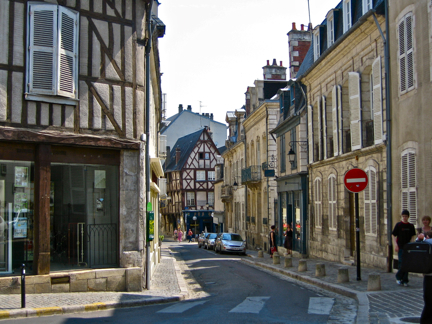 Just south of Paris, about two hours driving time, lies a city described by Julius Caesar as “one of the most beautiful cities in all of Gaule.” Located just about in the center of France, the city was refuge for Charles VII, after losing to Henry V at Agincourt in 1415, in the midst of the Hundred Years War. 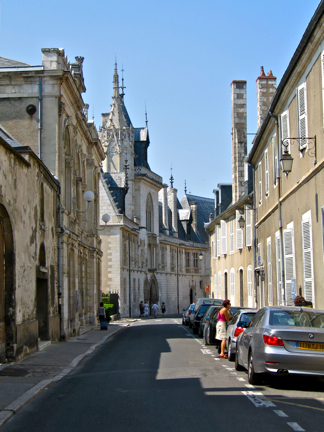 It houses what some writers have described as the “finest Medieval town residence in France,” the Palais Jacques Coeur. 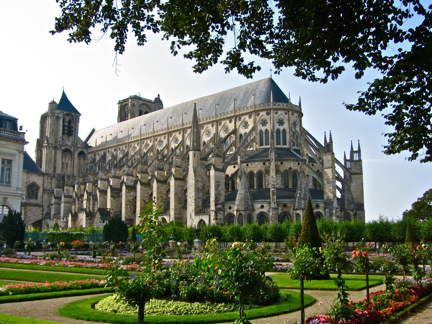 While Charles was given the nickname “King of Bourges,” it was really Jacques Coeur who reigned in Bourges. 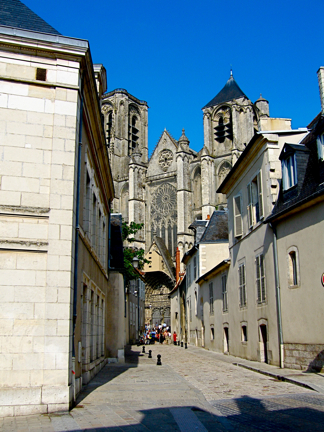 In fact, it has been written that Jacques Coeur was to Bourges what Jeanne d'Arc was to Orléans. 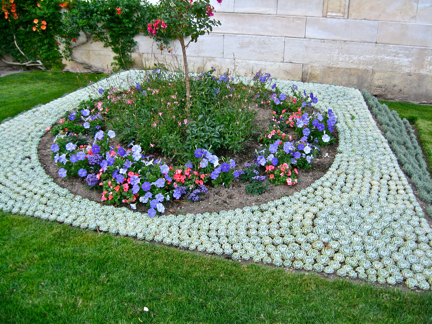 and a delightful 18th century garden adjacent to the cathedral. 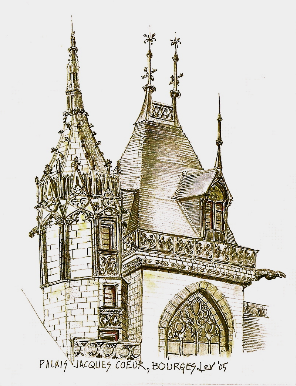 In the midst of the Gothic period in France – a time frame during which basic architectural construction developed and was detailed in the Gothic manner, primarily in church construction – a parallel building development occurred. 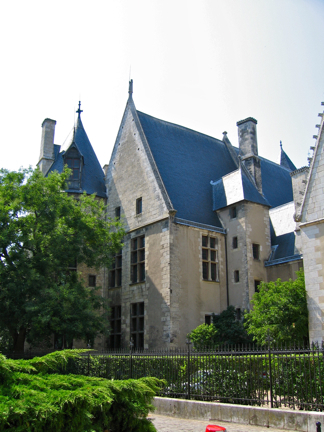 The fifteenth century was a time in which French nobles no longer required feudal-age fortified castles. They moved into town, out of the country – and thus was born the true meaning of a “town house,” as opposed to the glorified title given simple “row” houses by developers today. 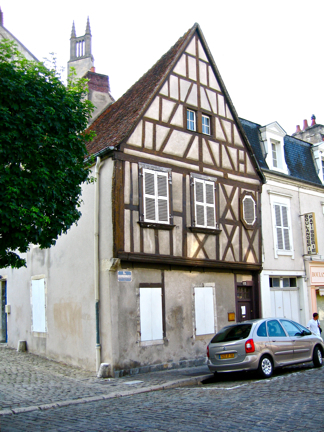 In France these extra-large homes became known as “hôtels,” fronted by elaborate facades, and often containing courtyards within. The internal courtyard – an especially large variation of the ancient atrium – became a dominant feature particularly in the Renaissance palazzi of Italy. 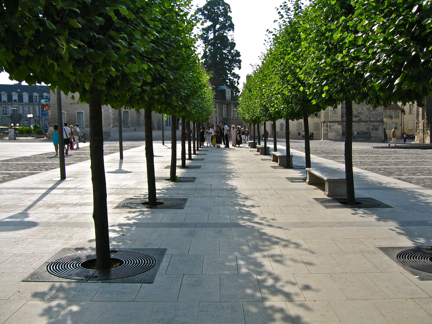 This is the street on which the house or palace sits (it is not, perhaps, so much a palace as it is a very large house). Just a bit of background and intrigue, before we get to see the building. 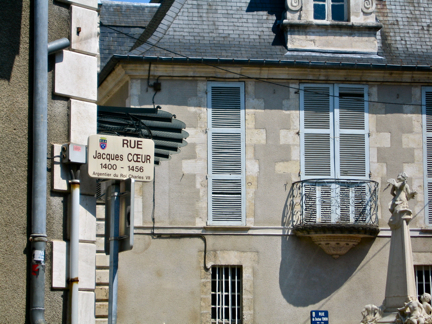 Jacques was born in 1400 into a merchant family, and apparently quickly climbed the social ladder of the time, to become King Charles VII's Superintendent of Finance (or as the street sign translates: “treasurer).” The palais was begun in 1443, and finished in 1451. Jacques Coeur created a fleet for the king, so it would no longer be necessary to hire Italian ships for trade to the east, and that fleet became the basis for the French presence in the Mediterranean. Despite his many financial accomplishments, such as running the Mint in Paris, personal and public debtors led to his arrest. 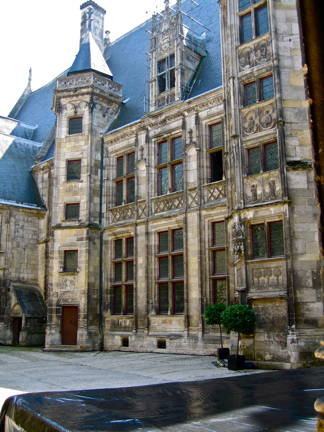 He was accused of “financial irregularities,” and imprisoned in 1451, just before interior completion of the palais. A trial resulted in a death penalty, but Jacques was spared by his friend Pope Nicholas V. He did escape prison in 1454, finding refuge in Rome, where he was given command of a crusade against the Turks by Pope Calixtus III. Jacques died of illness on the island of Chios in 1456. Chios is now a Greek island, just off the Turkish coast, in the Aegean Sea. An aside: an almost identical situation was to arise in the 17th century, with Nicholas Fouquet as the ill-fated protagonist. 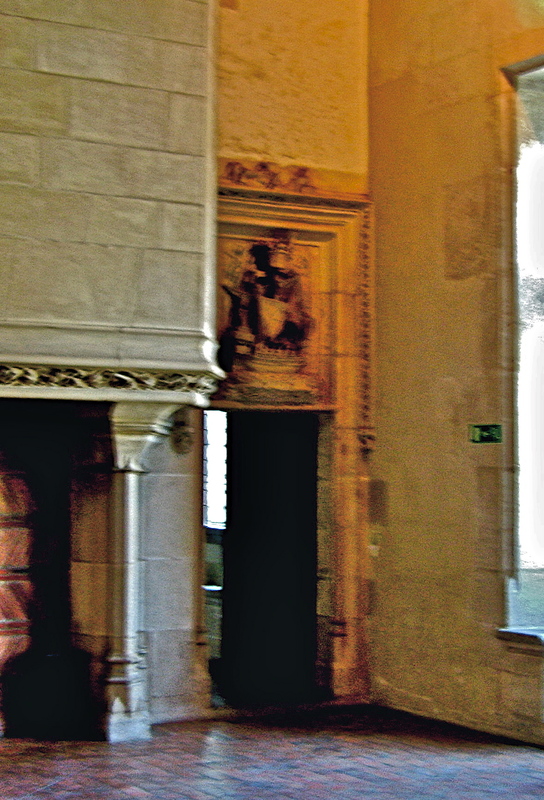 Fouquet had been appointed financial secretary to the court of Louis XIV, and while a rapidly rising star in the French political scene, he proceeded to expand his estate, known as the Château de Vaux-le-Vicomte. Apparently his ostentatious plans and new-found wealth provoked jealousy in the mind of his King, who was needled on by a fellow administrator, Jean-Baptiste Colbert, an old-monied man. 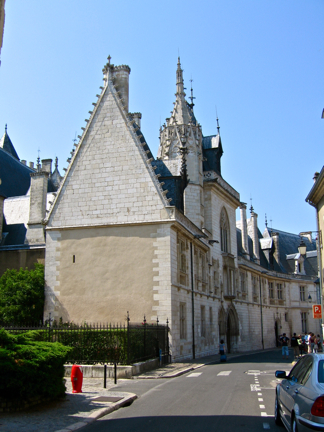 The result for Fouquet was imprisonment – history repeating itself. Roger Thomas Smith (1830 – 1903) died more than 70 years ago, and the book is out of copyright. It is obviously quite illustrative. A bit of serial vision here, as we approach the Palais from the south – it is the turreted building directly in front of us. The main entrance, with a slightly projected canopy over the main door, surmounted by a pointed gothic window. Notice, too, the cusp-like projections both on the end wall as well as the turret. In church design these elements were meant to blur the solid image of the building, merging it with the sky, in an attempt to spiritualize the religious structure. Here the effect is pure stylistic copying, using design motifs of the day – the gothic. For whatever reason, I waited a long time to finally get to Bourges. It is its own destination, and prior to entering, did this little sketch. To the west we view the southern end of the main wing of the house. 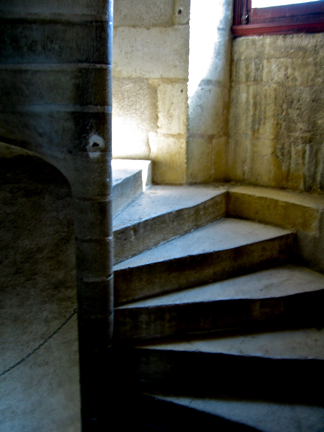 A stair is contained within the rectangular projection towards the right of the image. Stairs manifest themselves with windows at landings, which do not, of course, line up with floor lines – in other words, the windows in stairs are staggered vertically when compared to normal window positions. Notice, also, the quoin construction at corners of the various parts of the building, as well as the window surrounds. As we have seen, quoins go back to at least Akrotiri. 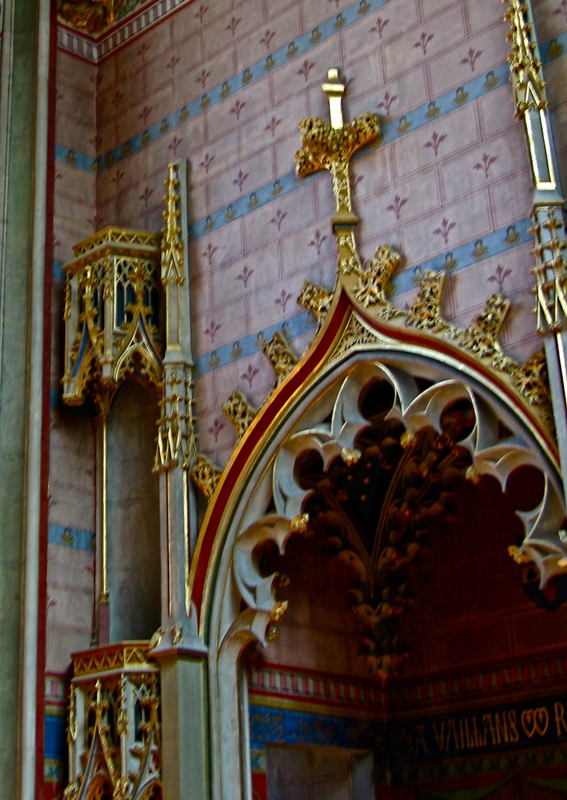 Gothic influence is felt in the spires, capped with delicate finials (the word “finial” is from the French fin or Latin finis 'end'). 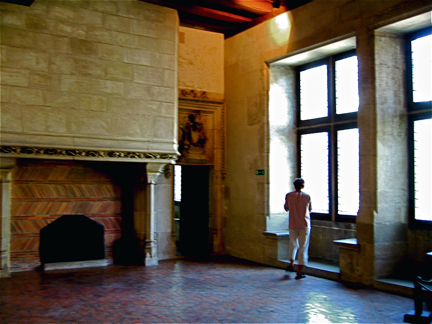 A bit more history: after Coeur's arrest, Charles VII confiscated the house, but returned it to Coeur's family in 1457. 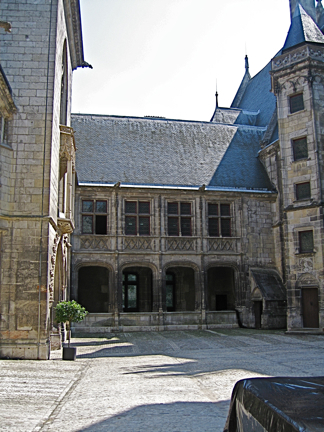 The same Colbert mentioned above, with regards Nicholas Fouquet, in yet another act of covetousness, purchased this house in 1679, but sold it again three years later to the town of Bourges, which used it as a Town Hall and later as a courthouse. The State purchased the palais, putting it in the jurisdiction of the French Historic Monuments Service, which carried out an extensive restoration. 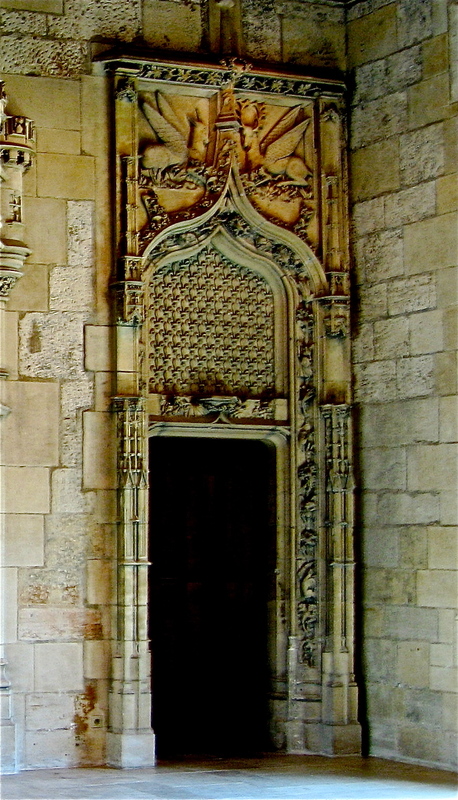 The large main door, probably used for a horse and carriage entrance, flanked on the left by a smaller personal door. Both openings are framed by pointed arches. Some strange goings-on if you look carefully. 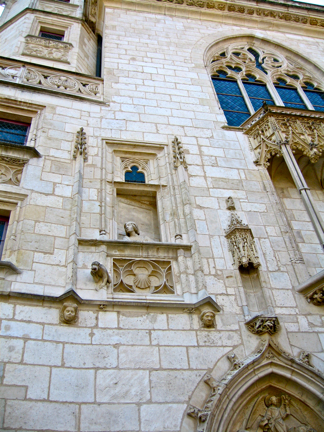 There is a faux window, with a head peering out, a monkey about to leap, heads used as brackets, in addition to some exquisitely carved stone sculptural effects, particularly in the canopy on the right. 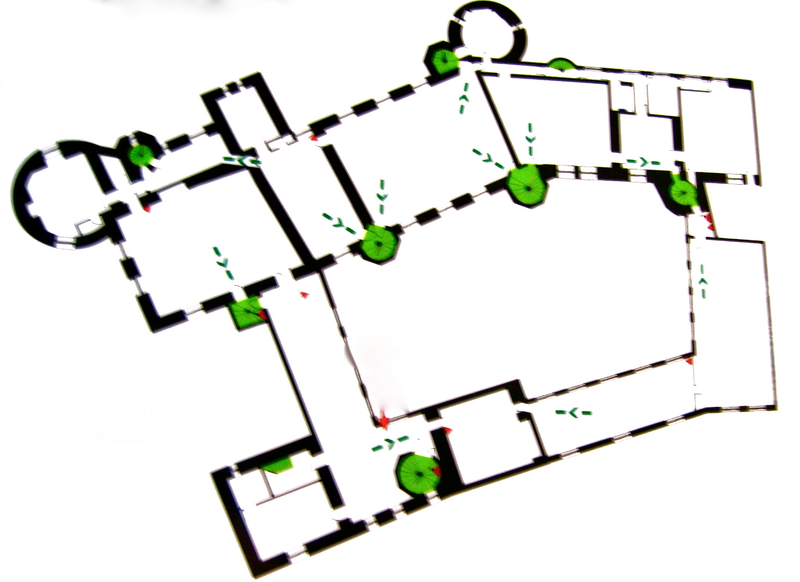 A floor plan shows the seven stairs in green. 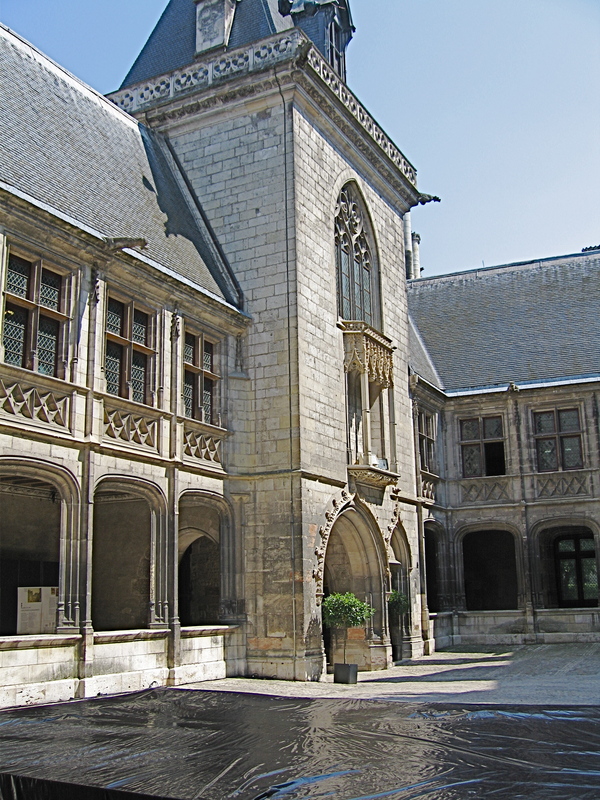 The southern wing, which connects the main element with the entrance wing. Strangely, the windows are either square-topped or slightly arched, not pointed. 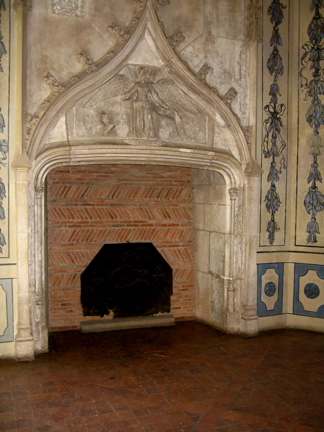 The entrance from the street, which is almost a mirror image of the street facade – notice, again the pointed arches in the entrance block. 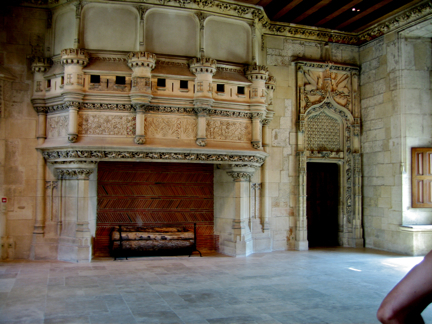 The banqueting hall features an enormous fireplace, replete with carvings of plant forms, surmounted by a miniature castle. 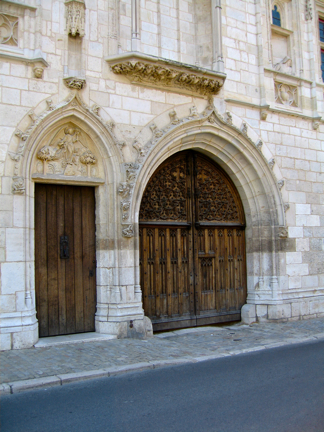 To the right, the door has a tympanum saturated with fleur-de-lys, reminding us of Jacque's perhaps misguided devotion to Charles VII. 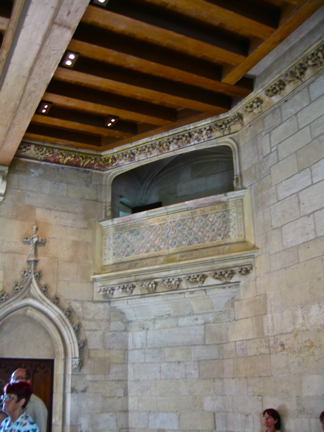 High in an opposite corner is a minstrel's gallery, whose balustrade still has some of its original coloring. 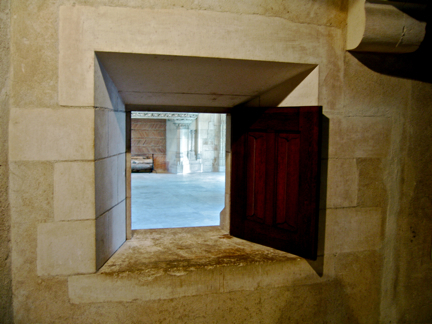 As an example of the almost modern amenities, there is a serving hatch in the pantry, through which serving dishes for the Banqueting Hall were passed. Additional features in the palais include a steam room, ostensibly for hygienic purposes, as well as latrines built into a staircase. 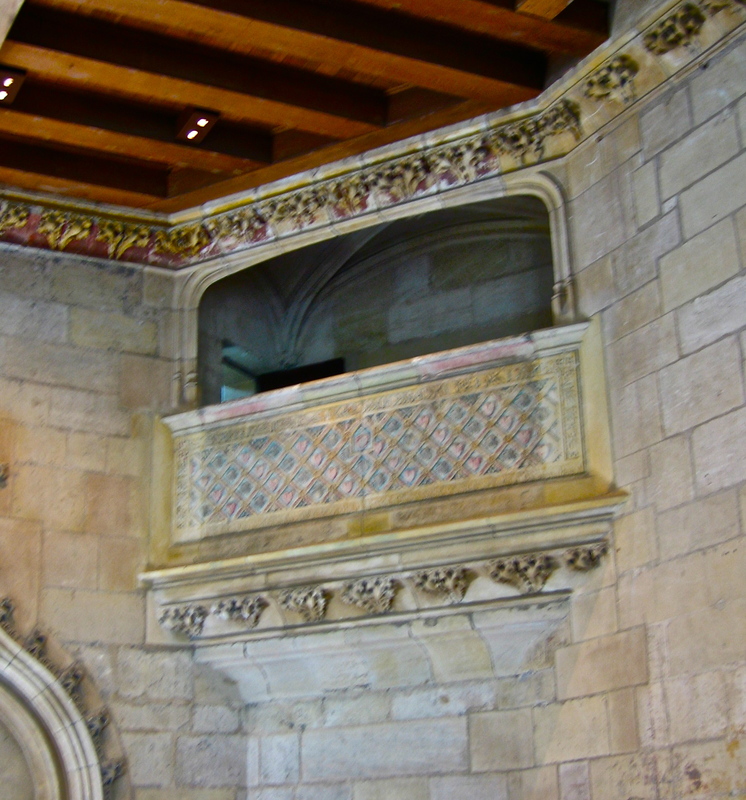 One of the seven spiral staircases. 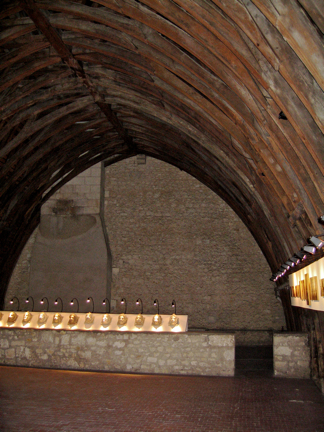 The attic roof is constructed with a pointed barrel vault in wood. 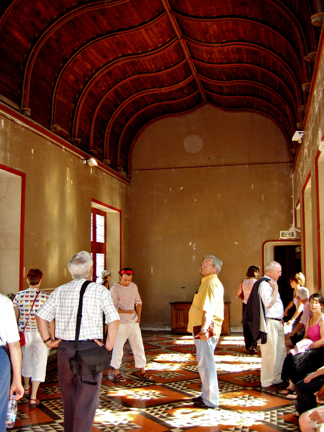 The room housed servants. 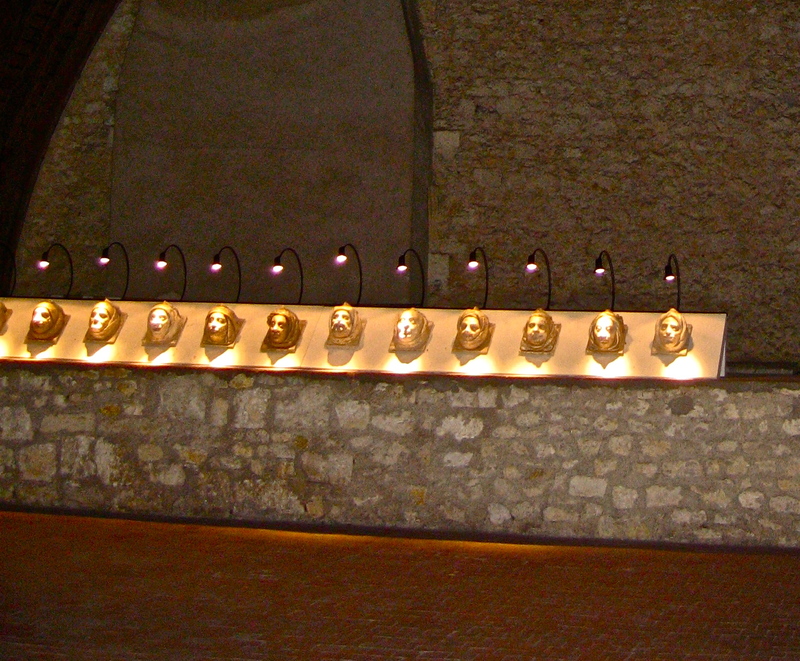 The collection of busts has been gathered from various parts of the palais. 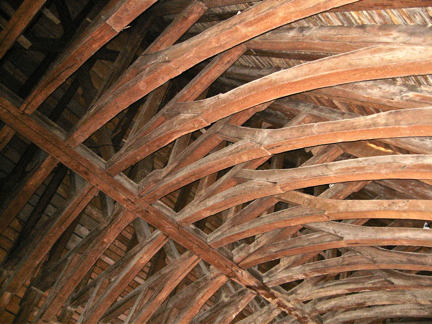 A detail of the roof construction, reminiscent of the Cathedral of Reims. 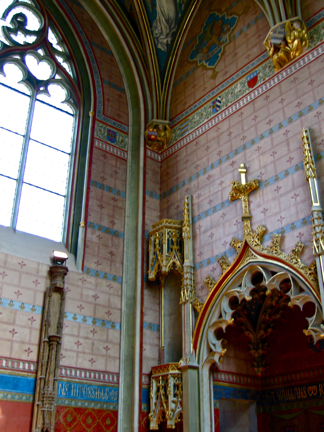 The chapel, seemingly ordinary until one looks up. 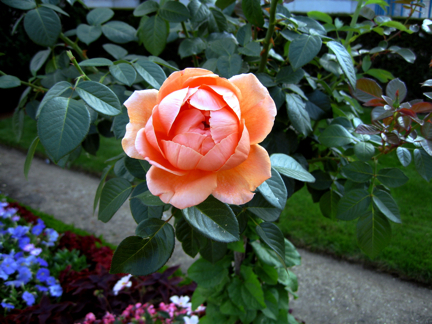 - that's a bit of the flamboyant. 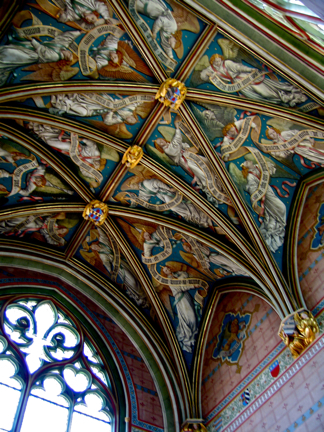 Quadripartite vaults, gilded bosses, pointed arches, and angels portrayed in starry skies. 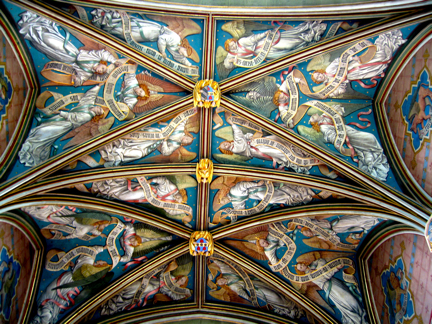 The paint was restored in 1869 by Deneulle. In summation, the palais was a transition between feudal castles and what was to be a traditional French mansion or chateau. Fortifications were now out of style and need. This particular design was articulate and functional, in that it separated various functional wings, yet connected them with gallery-like spaces, some of which were multi-functional, serving as entertainment areas. 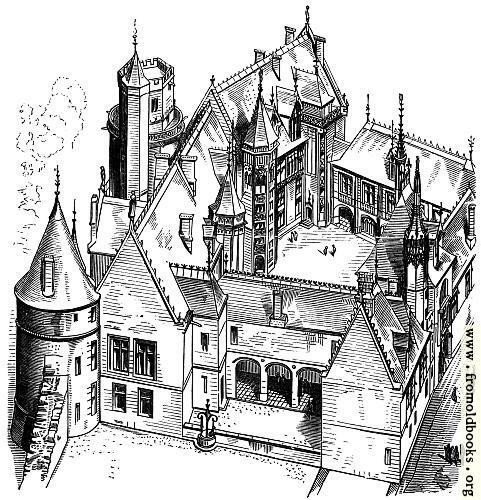 It has been suggested that the design followed “aristocratic designs” of the houses of Duke Jean de Berry, third son of John II, who controlled one-third of the territory of France during the middle of the Hundred Years' War (1340-1416). Another aside: John II The Good (Jean le Bon), of France, was depicted in a painting by Delacroix in 1830 at the Battle of Poitiers. 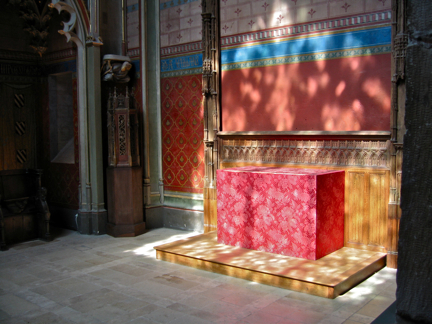 And as the circle closes on this chapter, we will end with this footnote: Jean le Bon, taken prisoner by the British, dying in London, was eventually laid to rest in the Royal chambers of Saint Denis.